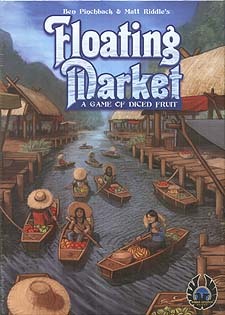 Floating Market - A game about Diced Fruit! Sometimes you have to go out on a limb to get the best fruit. Floating Market, from the designers of the hit game FLEET, contains a good mix of strategy and luck that will interest new and experienced gamers alike! Ama is tired, it has been a long day of chasing her grandchildren, and she needs a break. Ama has been around for a long time and she has a few tricks up her sleeve. With the promise of her famous fruit salad, Ama sends her grandchildren down to the Damnoen Saduak Floating Market to collect fruit. Players are vying to be the first to collect five different pieces of fruit from the market. Decide which fruit to go after each round, select dice to influence the outcome, and use special abilities from the buildings around the market. In Floating Market, players will navigate the market and nab the fruit by using polyhedral dice a new and exciting way!